Starting in the mid-19th century, private banks started to thrive in Chile, spurring growing concerns over the control of payment methods and persistent inflation. To this end, the government hired a mission led by economics professor Edwin Kemmerer of Princeton University and based the nascent central bank’s structure in one of the mission proposals. In August 1925, the Central Bank of Chile (CBoC) was created through Decree Law 486, which also established the bank's monopoly for issuing bank notes under a gold standard regime. A degree of independence to avoid capture by the public or private sectors was implicit in its ten-member board structure. Inflation, however, did not recede. Moreover, it was further heightened by a weak institutional framework. Inflation would only be controlled after the introduction of autonomy of constitutional rank in 1989. 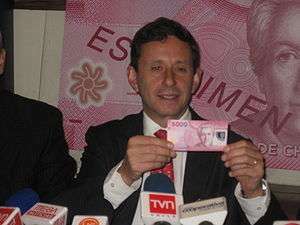 Central Bank President José de Gregorio Rebeco presenting the new $5,000 bill. The CBoC is granted autonomous status by Chile’s National Constitution, in order to secure independence from national authorities, providing credibility and stability beyond the political cycle. According to the Basic Constitutional Act of the Central Bank of Chile (Law 18,840), its main objectives are to safeguard “the stability of the currency and the normal functioning of internal and external payments". Therefore, the CBoC needs to control inflation to foster a stable currency, while the payment system’s normality requires functional financial intermediation, the provision of payment services and adequate risk allocation. To meet these objectives, the CBoC is enabled to use monetary and foreign exchange policy instruments, along with some discretion on financial and capital markets regulation. The CBoC is governed by a Board composed of five members appointed by the president, but ratified by the senate. Each term is ten years long and members are chosen in a staggered way every two years. The president appoints the Governor of the Board (and the bank) from existing members, for the minimum between the chosen member’s remaining term and five years. At least three members need to be present for the board to operate and measures are adopted with the support of the majority of present members. The Minister of Finance also participates in board meetings with the right to speak and, unless there is full consensus among board members, can suspend board resolutions for 15 days. The CBoC is Chile's monetary authority and its monetary policy is guided by an inflation targeting regime, which is fully in place since 1999. Specifically, the CBoC pursues an inflation target of 3%, with a tolerance range of 1% (above or below), with the objective of anchoring market expectations in a two-year horizon. Decisions on the monetary policy rate (MPR), the reference interest rate for the economy, usually take place on a monthly basis in the monetary policy meetings, although extraordinary meetings can be called. If inflation expectations are diverging from the 3% target or if there are events since the previous meeting with an anticipated effect in the price level, the CBoC might change the MPR. The monetary policy is carried out through the daily interbank interest rate. Inflation has followed a relatively stable trajectory since the inception of the targeting regime, remaining under 10% ever since; yearly inflation only surpassed the tolerability threshold of 4% in 2007 and 2008, with respective readings of 4.4% and 8.7% in historical terms. The foreign exchange policy is led by a floating exchange rate, although the bank reserves the right to intervene in the foreign exchange markets. Although unusual, the CBoC has used announced interventions in four occasions since 1999, when the economy transitioned to a floating exchange rate scheme, all of which were sterilized. Twice, in August 2001 and in October 2002, the central bank intervened to deter a depreciation, while the remaining two events, announced in April 2008 and January 2011, where aimed at strengthening the international reserves position of the bank through daily and pre-announced dollar purchases. ↑ "Normas Monetarias y Financieras Capítulo 3.1" (PDF). ↑ "Base de Datos Estadísticos". 1 2 Corbo, Vittorio, and Leonardo Hernández. "Ochenta años de historia del Banco Central de Chile." Working Paper No. 345, Central Bank of Chile (2005). 1 2 3 Central Bank of Chile website, About, Functions. 1 2 3 4 5 6 Central Bank of Chile: Monetary Policy in an Inflation Targeting Framework. Central Bank of Chile, January 2007. 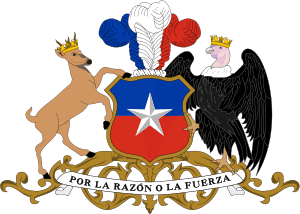 ↑ Law 18,840, Basic Constitutional Act of the Central Bank of Chile, Title I, Section 3. ↑ Central Bank of Chile, Statistics Database, Prices, Historical Information, Headline CPI annual change. ↑ Central Bank of Chile, Press Release, April 10, 2008 (in Spanish). ↑ Central Bank of Chile, Press Release, January 3, 2011.